Larks Lake is a small, shallow lake located in Center Township in northern Emmet County. Larks Lake is fed by spring outlets. It is the headwaters of Brush Creek; a tributary flowing into the west branch of the Maple River, and also what is known as the Pleasantview Swamp. Larks Lake is considered an important recreation resource for county residents with access provided at the Center Township Park and boat access at the end of Kaz Road. 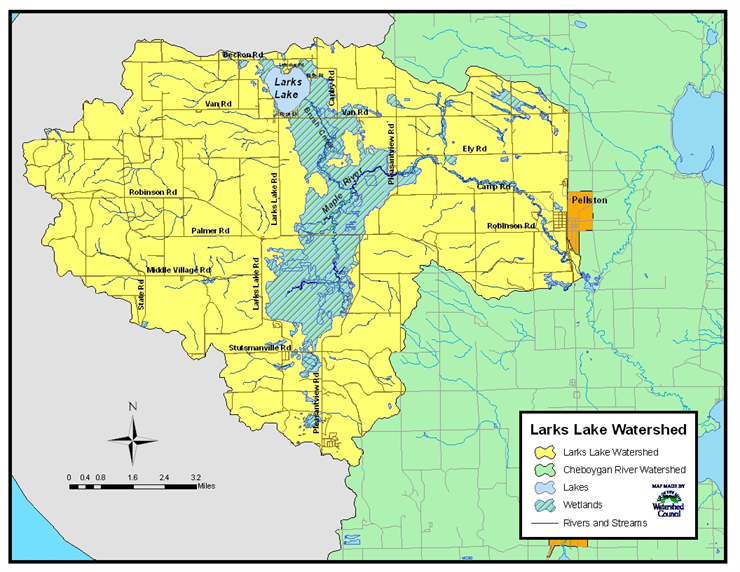 The Larks Lake Watershed land surface area is 4,640 acres. The Larks Lake Watershed is a small subwatershed of the larger Cheboygan River Watershed, which covers 1,461 square miles (935,000 acres) in Cheboygan, Otsego, Emmet, Presque Isle, Montmorency, and Charlevoix Counties. The Larks Lake Watershed land area makes up 0.5% of the Cheboygan River Watershed. Lake has approximately 4 miles of shoreline. About 1.5 miles (37.5%) of lakeshore frontage is in residential development and 2.5 miles (62.5%) are currently undeveloped. About 1.74 miles of undeveloped frontage is characterized by wetland vegetation and soils. The Maple River is a tributary to Burt Lake. The West Branch of the Maple River originates in a large wetland called the Pleasantview Swamp, and is supplemented by the inflow of Brush Creek which drains from Larks Lake. The Four Lakes. It is home to most of Michigan’s large reclusive mammals, including bobcat, black bear, and river otter. Bald eagles and ospreys nest in the swamp. Soils consist of Carbondale and Tawas mucks with Roscommon mucky sand along the margins. Fifty-four percent of the swamp is publicly-owned by the State of Michigan (Fuller, 2006). Around Larks Lake, land use is 35% seasonal or permanent residential, 10% recreational (township park) and 55% forested or forest wetland. Approximately 25% of the Larks Lake shoreline is owned by the State of Michigan. Local Governmental Agencies within the Larks Lake Watershed The Larks Lake Watershed lies within the jurisdiction of the Emmet County government and Center Township. Emmet County administers the zoning for Center Township. The watershed is also within the jurisdiction of a regional government agency- the Northwest Michigan Council of Governments. Larks Lake is a shallow marl lake, and is naturally shallower than most typical marl lakes. Marl sediments are a mixture of clay, sand, and calcium carbonate from limestone that tends to be soft in texture, which is deposited on firm substrates and aquatic macrophytes. All the major lakes of the Cheboygan River Watershed have moderately “hard” water, in reference to the levels of dissolved calcium and magnesium carbonates originating from the limestone bedrock geology of the Watershed and conveyed via groundwater to surface waters (Fuller, 2006). Marl lake deposits are rich in calcium carbonate that precipitates during the photosynthetic processes of aquatic plants, such as Chara (McDonough, 2002). Sediment in the northwest cove of the lake is organic muck, and muck deposits are deep in this area. Observational depths vary from about six inches to over five feet in depth, as measured with a paddle at various locations. This section of the lake is adjacent to forested wetlands with peat soils. Locally produced organic matter in peat soils will accumulate and bury underlying mineral substrates (Keddy, 2002). Also in the northwest cove there is an area with wood fragments below two to three feet of muck soils. This may be due to the presence of the Carbondale soil series, in which wood fragments are a common component below 12 inches of depth (NRCS, 2004).